Adversely, many others who survive the blackout turn into "Shaitan" - a group of evil, malicious people who become animalistic in their drive to hurt and kill off the rest of the innocent population. 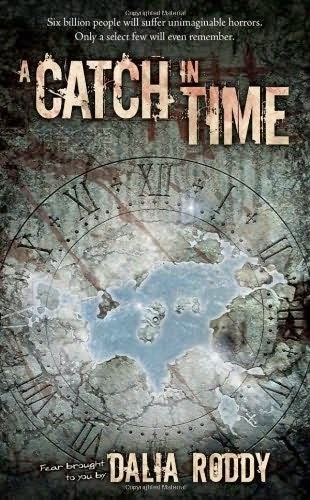 The synopsis for A Catch in Time initially caught my eye because it reminded me of a cross between Stephen King's Under the Dome and AMC's The Walking Dead. Plus, I've always enjoyed apocalyptic stories. Roddy's writing style is simple and fun without going into too much (or any) detail about the alien / otherworldly events that may have triggered the blackout. In fact, Roddy never reveals exactly who or what caused the blackout, although some of the characters suspected it may have been government-related. This 551-page novel is quite the tome, but you'll hardly notice as you speed through it. The book is fast-paced with hardly any lulls, and follows the same group of core characters for a period of years following the blackout. While A Catch in Time is intriguing during your time reading it, the conclusion is hardly memorable. The climax lacks excitement, but surprisingly, it doesn't spoil the novel completely. I think perhaps my favorite aspect of this novel was reading about the relationships formed and maintained by the characters over the years. After all, family is what you make it, right? I've noticed Dalia Roddy hasn't written anything else, but if you enjoy post-apocalyptic novels, you might also enjoy the novels displayed below. What are your favorite post-apocalyptic novels? Share your thoughts with us in the comments section below!